Earning an MA in English was one of my key learning experiences. This post examines that experience for deeper learning about my skills, knowledge, and values. Hmm. Though I suspected that I needed more formal education, none of those options really attracted me. One day while enjoying an unusual chance for reading a series of comments, from an English teacher, critiquing an introductory paragraph by my oldest son, I realized that in spite of a life-long love of literature and writing, I had never received that kind of overt scrutiny of my writing. Although I loved writing and literature and began my undergraduate education as a Journalism major, I quickly switched to Biology and ultimately graduated with a BS in Computer Science. I blamed my parents for providing more emotional support for science than humanities. However, I also recognized in myself, something I mentioned in an earlier post, on Information Overload. I am attracted to straight forward, defensible solutions to well structured problems. My natural interests in literature, philosophy, and psychology, led to messy discussions, and strongly differing opinions. Instead of learning more about how to argue (exchange ideas) in arenas with more “ill-structured” problems, I chose paths that felt safer because they seemed to offer more defensible algorithms and solutions for the problems I was likely to address. I decided that if I was going to accept the challenge of Grad school, with its investment of time, energy, and money, while also working full time and helping three other people navigate their lives, I wanted to learn about things for which I cared deeply and face challenges previously avoided. I was accepted to the program for a Master of Arts in English at San Jose State University, with the conditional requirement of completing 18 units of undergraduate work before beginning graduate level courses. Completing my degree took five years. Over the years from about 2003 through 2007 I spent one day each week becoming a student again, leaving early and returning home about midnight. My Mother blessed me and her grandchildren by stepping in each week while I was away, helping in many ways. To do well in my literature courses I had to learn to think in new ways. I had to learn how to argue a point. In the past, as I’ve mentioned, I liked addressing problems with straight forward solutions. When I first began addressing questions related to various works, I found myself floundering for answers — wondering how to know the right answer. I had some weird half formed idea that somehow the answered existed outside the work in the body of some critique of the work. What I did NOT have yet was the “a-ha” that an answer could come directly from me and my experience of the work as long as I could support my answer with relevant details from the text. This was a huge step for me because I realized that I could apply this new found freedom to decide and express what I thought, based on the evidence available to me, to any situation. This particular “a-ha” gave me a new compass in life. I realized that in any situation — instead of trying to figure out the “right” answer, I could determine my position based on what I knew. Of course, with my background fear of information overload, and my frequent lack of much research, that means that I simply don’t have a strong opinion on many topics because I don’t know much about them. However, as I continue to further embrace inquiry and suspended judgement, I don’t believe I’ll necessarily become more opinionated. If one is “suspending judgement” how can one be polarized? 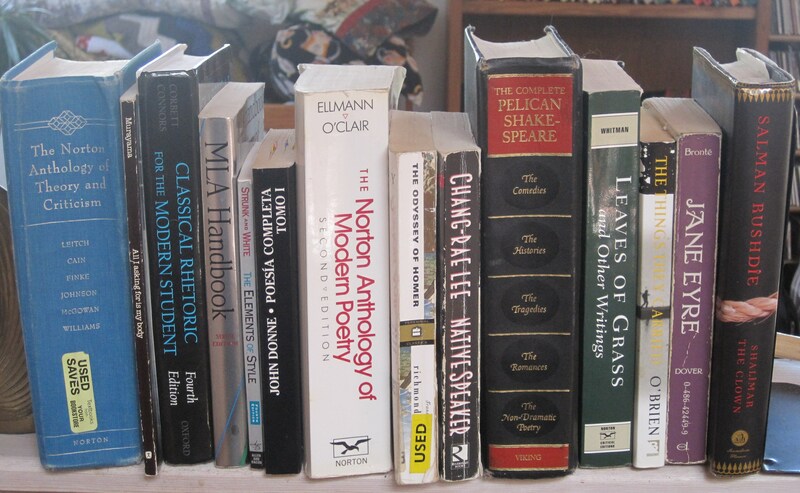 pass two comprehensive written essay exams: one covering literature from ancient European works (like Homer’s Iliad and Odyssey) through American and British English literature of the18th century, another covering American and British English literature from the 19th century through the 20th. I always liked reading literature. Reading was the easy part of my program, though it was challenging to find enough time, and some works initially seemed dull. I also enjoyed having one day a week completely dedicated to “being a student.” I went to campus early, worked in the library, and went to class in the evening. Writing short papers was fun, but writing long papers was hard. Writing a 25 page paper on a particular theme requires finding a lot of different things to say supported by a lot of research. I could still learn more about strategies for developing a 25 page paper on a literary theme. Immersion in my studies undoubtedly made me less sensitive and available to my children’s needs, but my regular absences also provided greater opportunities for connections between them and my Mother. I suspect that my hard work over a significant time period for something I cared about was a good example for them. Another aspect of this experience that I hope was valuable to them was the biggest challenge I had to overcome. The first time I took the second essay exam I did not pass. Not only was that excruciating for the embarrassment factor, but for the realization that before I could take it again I would have to endure six more months of daily early morning study. The main “silver” lining to this was the hope that it was positive for my kids to know that I could fail at something I cared about and not give up. Part of me wanted to give up, but I could not find any good reasons to support that decision. The second time I took the second essay exam I knew I had strong answers for each of the questions and I felt good. That was Fall 2007, and that Thanksgiving Holiday I celebrated by cooking dinner for a close group of friends. Working for my Master’s degree helped me learn to argue and increased my self-discipline and perseverance. All of my studies provided tremendous rewards through the pleasure of deep learning of diverse literature, history, psychology, philosophy, and cultures. I cannot think of any particular weaknesses this experience makes me more aware of, that are continuing challenges and barriers for me. During my studies instead of trying to avoid “information overload” (as I often have!) I dived into as many sources as I could related to any topic I was working with. I did run into time constraints and I never conquered the process of writing a 25 page literary paper well, however, I could learn that if necessary. When I think deeply about this experience my primary feelings are affection for the pleasure of the learning and tremendous satisfaction for meeting a demanding challenge. Note: This post is one of three developed for an example of examining one’s key learning experiences to learn more deeply about one’s skills, knowledge, and values. This entry was posted in Learning Portfolios, Reflection and tagged Argument, Education, English literature, Graduate school, Information overload, Master's degree, San Jose State University, self-discovery, Writing on May 23, 2013 by skroeze. This post reflects on one of my key learning experiences, learning Yoga, for further insights into my skills, knowledge, and values. While growing up I spent a lot of time at the city library and at some point, perhaps about 1970, I discovered books about Yoga. I was intrigued by details of esoteric practices like the cleansing Kriyas and inspired to have the kind of power to influence my well being that was promised by the teachings I read. That year my parents gave me Yoga for Young People by Michaeline Kiss. I believe they hoped to support my interest while also steering me away from more extreme practices. Kiss’ book provided a wonderful introduction to a regular yoga practice. I studied her book thoroughly and adopted her suggested seven-day exercise plan as a regular habit. By following the instructions, photos, and drawings in a variety of books I learned to execute a range of yoga poses including the lotus, crane, cobra, locust, bow, dead man’s pose, shoulder stand, plough, and headstand. I had to be able to follow instructions, use my body and my concentration, and establish regular times and places for my practice. My practice of poses also enhanced my awareness of balancing and breathing. With reference to the “Skill Areas Worksheet” I selected six areas, large motor skills, information literacy, sustainability knowledge and engagement, helping individuals, science, and social science, that were employed and enhanced by my Yoga exploration. I used large motor skills to execute poses and information literacy for finding multiple books, and developing my physical practice through interpreting text and images. The Sustainability knowledge and engagement and Helping individuals categories relate to my focus on yoga as a lifelong care practice for optimal physical and mental well being. My Science and Social Science knowledge were increased by increased knowledge of body mechanics and of some practices from a culture different than my native culture. Many times my Yoga practice has lapsed. Often aches and pains brought me back because I knew from experience that with regular yoga practice I felt physically flexible and balanced. Now in my sixth decade, experiencing previously unimagined vulnerability to aches and pains, I’m more faithful to my practice than ever before and I’ve returned to Michaeline Kiss’ recommended daily routines, for the variety and balance they offer, augmenting them with additional poses as feels appropriate. An “a-ha” for me that came through reading about yoga was a sense of empowerment to apply knowledge to my own life. While growing up, I read fiction books endlessly, and was sometimes wistful about the gap between my virtual characters’ life situations and my own. In contrast, Yoga books invited and enabled me to make the poses and their potential benefits real through my own practice. Learning basic poses was easy and enjoyable. 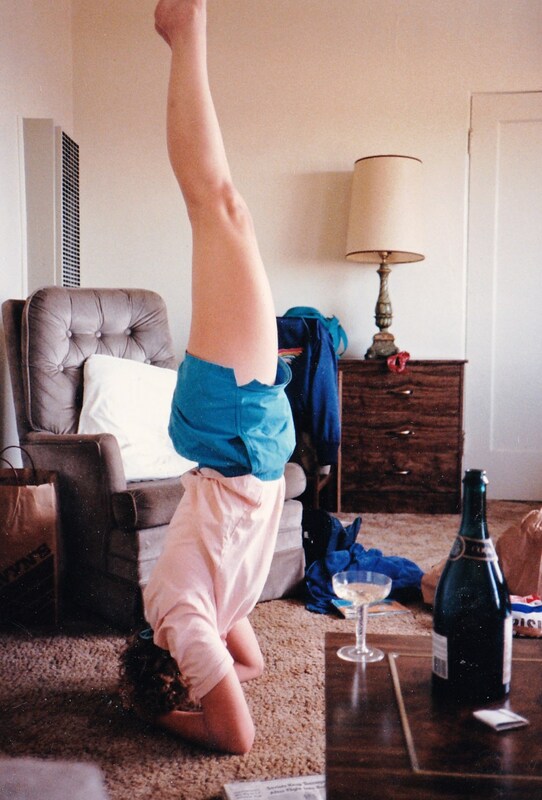 I was naturally flexible and already had some basic gymnastics skills. More challenging, was maintaining a progressive practice. I established a regular practice, to a degree .. but I was not faithful nor inspired enough to develop to an advanced stage or learn deeply enough to become a qualified teacher. Because I have such an abiding and deep affection for Yoga, I believe that not developing expertise is evidence of not taking initiative and responsibility, not following through, with something that part of me embraced deeply. I see this as a form of sabotage. Part of me betrayed another part of me. I never examined this dichotomy before, but upon reflection, I believe that a number of habits, tendencies, preconceptions, prejudices, and distractions conflicted with my interest in yoga and I never consciously addressed the conflict. My Yoga practice has influenced others more peripherally than intentionally. For example, my children grew up with my practice and although none of them practiced with me, they now each have their own practice. There may be no connection, but if so, it’s an interesting coincidence. Examining this experience reinforces my awareness that determined, creative research can uncover valuable information. I see my relationship with “information” as both a strength and a weakness. On the one hand, I’m always aware that tremendous amounts of information await discovery. On the other hand I’m sometimes afraid of being inadequate to the task of digesting, evaluating, and interpreting a necessary amount to become truly “responsibly knowledgeable” in a particular area. With more conscious awareness of this barrier I will research more issues I care about. Note: This post is one of three developed as part of my personal example of exploring key learning experiences for deeper self-awareness. The steps for the project will be described in detail on a page of this site. Kiss, M. (1971). Yoga For Young People. Indianapolis: Bobbs-Merrill Company, Inc. This entry was posted in Learning Portfolios, Reflection and tagged headstand, Inquiry, integration, Key Learning Experience, Learning, reflection, self-discovery, Yoga on May 21, 2013 by skroeze. 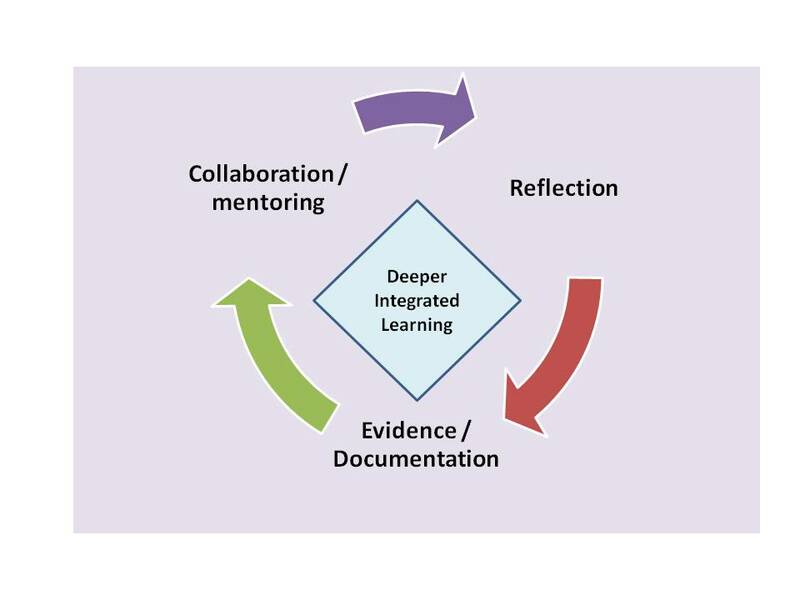 The process of developing Learning Portfolios helps learners develop deeper connections through a cycle of reflecting on their learning, connecting their reflections to evidence, and receiving and responding to feedback. Alasko’s quote, relating a lack of integration with despair, comes from a column that includes discussion about the need to integrate one’s life experiences into a “coherent whole.” Alasko referenced Erik Erikson’s work on life stages, ego identity, and the value of reaching one’s later years with a sense that one’s life path has been meaningful. A few months after reading Alasko’s column, I heard Melissa Peet, (now Director of Integrative Learning and Knowledge Management at the University of Michigan Ross School of Business), share examples of using a portfolio process to help individuals come to a more conscious awareness of and a deeper sense of integration with the core skills and knowledge they’ve gathered from key learning experiences in their lives, both formal and informal (ePortfolio California,2011; Peet, 2010). Because I’m deeply interested in practices that help people move toward integration and meaning, Peet’s talk inspired me to learn more about portfolio development processes as a self-discovery vehicle. Her work with the Integrated Knowledge Portfolio Process (IKPP) ™, lead me to a broader study of best practices developing around Learning Portfolio use and the discovery that Learning Portfolios are in wide use in many contexts (Cambridge, Cambridge, & Yancey, 2009; Lynch & Shaw, 2005; San Francisco State University,2013; University of Michigan, 2009; Virginia Tech & University of Georgia, 2013; Wright, 2001; Zubizarreta, 2009). A common thread driving the growing use of Learning Portfolios is a goal of deepening students’ integrated learning – helping them better integrate their learning into a “big picture” framework that extends outside a particular course into other aspects of their lives. Personal Portfolios traditionally represent a showcase of a one’s work. Learning Portfolios also include examples of one’s work, but with the important addition of reflective thought related to that work, ideally developed with feedback from mentors and/or peers. Significant evidence shows that, reflective thinking and writing about one’s learning, in connection with specific examples of the fruits of that learning, help deepen and broaden learning of particular concepts and learning about one’s self. This site will explore some key elements of Learning Portfolio practices, look at some ways they are being used, and provide some guidelines, recommendations, and examples to help you get started, whether you want to help your students by integrating a Learning Portfolio into a class you teach, or further your own journey of self-discovery by completing a personal Learning Portfolio exploring some key learning experiences selected from any stage and setting in your life. Cambridge D., Cambridge B., & Yancey K.B., (Eds.). (2009). Electronic Portfolios 2.0: Emergent Research on Implementation and Impact. Sterling, VA: Stylus. Lynch, B. & Shaw, P. (2005). Portfolios, Power and Ethics. TESOL Quarterly. 39(2) 263-297. Peet, M. (2010) The integrative knowledge portfolio process: A Guide for Educating Reflective Practitioners and Lifelong Learners. MedEdPORTAL, June. Wright, W.A. (2001). The Dalhousie Career Portfolio Programme: A Multi-faceted Approach to Transition to Work. Quality in Higher Education. 7(2) 149-159. Zubizarreta, J. (2009). The Learning Portfolio: Reflective Practice for Improving Student Learning (2nd Ed.). San Francisco: Jossey-Bass.